2003-07-07. New. Ships with Tracking Number! INTERNATIONAL WORLDWIDE Shipping available. Buy with confidence, excellent customer service! Augsburg Fortress Publishers, 2003-07-01. 1st Fortress Press Pbk. Ed. Paperback. Used:Good. 1993-01-02. New. Ships with Tracking Number! INTERNATIONAL WORLDWIDE Shipping available. Buy with confidence, excellent customer service! 1997-07-09. New. Ships with Tracking Number! INTERNATIONAL WORLDWIDE Shipping available. Buy with confidence, excellent customer service! 1992-10-30. Good. Ships with Tracking Number! INTERNATIONAL WORLDWIDE Shipping available. May not contain Access Codes or Supplements. May be ex-library. Shipping & Handling by region. Buy with confidence, excellent customer service! Augsburg Fortress Publishers, 1997-02-01. Hardcover. Used:Good. Chariot Victor Pub. Hardcover. 0745921426 New Condition. . New. Chariot Victor Pub. Hardcover. 0745921426 Like New Condition. . Fine. 2003-07-07. Good. Ships with Tracking Number! INTERNATIONAL WORLDWIDE Shipping available. May not contain Access Codes or Supplements. May be ex-library. Shipping & Handling by region. Buy with confidence, excellent customer service! Chariot Victor Pub, 1993-01-01. Hardcover. Used:Good. 1997-07-09. Good. Ships with Tracking Number! INTERNATIONAL WORLDWIDE Shipping available. May not contain Access Codes or Supplements. May be ex-library. Shipping & Handling by region. Buy with confidence, excellent customer service! Fortress. Hardcover. 0800629876 New Condition. . New. 1993-01-02. Good. Ships with Tracking Number! INTERNATIONAL WORLDWIDE Shipping available. May not contain Access Codes or Supplements. May be ex-library. Shipping & Handling by region. Buy with confidence, excellent customer service! Fortress. Hardcover. 0800629876 Like New Condition. . Fine. US: Fortress, 1996. Fortress 1996 1st Printing Fine/Fine DJ Previous owner's stamp inside cover and on page edges. Bright color illustrated pages. Decorative end papers.. 1st Printing. Hardcover. Fine/Fine DJ. Fortress, 1997-02-01. Hardcover. Very Good/No DJ. Picture does not match book; 8vo; no DJ; black cloth boards with gilt titles; light wear/scuffing to boards/spine; head/tail very lightly bumped;illustrated; Text unmarked and clean. Pictures available upon request. Orders will be mailed either on the day ordered or the next business day. Expedited shipping available. Lion Pub Plc. PAPERBACK. 0745951198 ref 920 d . Very Good. 2003. Minneapolis, MN: Fortress Press, 1996. Book. Very Good+. Hardcover. American First. Complete number line from 1 to 10; minor wear; otherwise a solid, clean copy with no marking or underlining; collectible condition; well illustrated with both black and white and color photographs as well as black and white and color reproductions of works of art..
Minneapolis: Fortress Press. Fine copy in fine dust jacket. 1996. 1st. hardcover. Small 4to, 256 pp., An Authoritative Illustrated Guide to All the Major Traditions of Music for Worship . Lion Books. Hardback. 256pp. 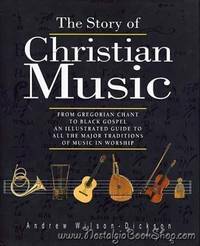 An illustrated introduction to the history and practice of Christian music. The main body of the text goes through the whole vast panoply of Christian music's history. The book looks at music in the Orthodox tradition and in Africa, as well as music for worship in 20th-century Europe and America. Dust wrapper is rather aggressively price clipped to inner flap. Otherwise clean and neat. Very good copy in good dust wrapper . Hardback. 1992. Augsburg Fortress, Publishers, 1997. Hardcover. Good. Disclaimer:A copy that has been read, but remains in clean condition. All pages are intact, and the cover is intact. The spine may show signs of wear. Pages can include limited notes and highlighting, and the copy can include previous owner inscriptions. At ThriftBooks, our motto is: Read More, Spend Less.Dust jacket quality is not guaranteed. Chariot Victor Pub. Hardcover. 0745921426 Minor shelf-wear only, otherwise in excellent used condition. . Very Good. 1992. London: Lion, 1992. generally fine copy. Over 1kg weight - postage overseas may be extra.. First Edition. Hard Cover. Very Good/Very Good. 4to - over 9¾" - 12" tall. Chariot Victor Pub, 1993-01. Hardcover. Good. Augsburg Fortress, Publishers, 2003. Paperback. Acceptable. Disclaimer:A readable copy. All pages are intact, and the cover is intact. Pages can include considerable notes-in pen or highlighter-but the notes cannot obscure the text. At ThriftBooks, our motto is: Read More, Spend Less.Dust jacket quality is not guaranteed. Chariot Victor Pub. Used - Good. Former Library book. Shows some signs of wear, and may have some markings on the inside. Lion Hudson PLC, 1992. Hardcover. Good. Disclaimer:A copy that has been read, but remains in clean condition. All pages are intact, and the cover is intact. The spine may show signs of wear. Pages can include limited notes and highlighting, and the copy can include previous owner inscriptions. At ThriftBooks, our motto is: Read More, Spend Less.Dust jacket quality is not guaranteed. Lion Hudson PLC, 1992. Hardcover. Very Good. Disclaimer:A copy that has been read, but remains in excellent condition. Pages are intact and are not marred by notes or highlighting, but may contain a neat previous owner name. The spine remains undamaged. At ThriftBooks, our motto is: Read More, Spend Less.Dust jacket quality is not guaranteed. Lion Hudson Plc, 10/31/1992. Hardcover. Used; Good. **WE SHIP WITHIN 24 HRS FROM LONDON, UK, 98% OF OUR ORDERS ARE RECEIVED WITHIN 7-10 DAYS. We believe you will be completely satisfied with our quick and reliable service. All orders are dispatched as swiftly as possible! Buy with confidence! Fortress Press. Used - Good. A sound copy with only light wear. Overall a solid copy at a great price! some highlighting All orders guaranteed and ship within 24 hours. Your purchase supports More Than Words, a nonprofit job training program for youth, empowering youth to take charge of their lives by taking charge of a business. Lion Pub Plc. Used - Very Good. Ships from the UK. Former Library book. Great condition for a used book! Minimal wear. 100% Money Back Guarantee. Your purchase also supports literacy charities.